If you are planning on moving to Sydney, make sure to check out our top ten things to do when you get over there and maybe you can tick a few off the list! 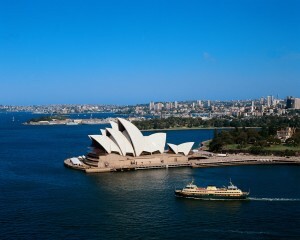 We asked a local Sydneysider, Russell Ward, for his opinion on the best things to do in the city. Having lived in Sydney for more than seven years, it’s easy to think of the many iconic sights and sounds of the city, but difficult to sum up only ten great things to do here when such an array of experiences and activities dominate the region. Sydney is an extravagant, exhibitionist kind of place where sun-blazed beaches and sandstone coves sit next door to a wild ocean and pristine harbour. Opinions will therefore vary depending on who you are and what you enjoy doing, but here are my top ten things to do in Australia’s most famous city. Sydney wouldn’t be Sydney without its magnificent bridge standing proudly over the harbour. One of the most memorable experiences of my first visit to Sydney was the climb to the Harbour Bridge’s top. If you’re good with heights, the climb offers uninterrupted views from the city skyline to the Harbour Heads. Recognised as one of Australia’s most memorable sights, the Opera House with its splendid sails and unique position edging out onto the harbour is a must-see on any visitor’s list. Head to one of the many shows – from opera to music concerts, comedy to theatre – and close by are the Museums of Contemporary Art and Sydney, which are also worthy of a visit. The city’s meeting point is Circular Quay, where ferries, buses and trains terminate, and tourists gather to look at the Bridge and Opera House. Next to Circular Quay is The Rocks, Sydney’s oldest area and home to cobblestone lanes, hidden pathways, quaint arts and crafts shops, historic bars and hotels. Sydney’s premier city beach, a stone’s throw from the central business district, is a perfect place to swim, surf or sunbathe. Given its popularity amongst tourists, it is one of the busier beaches, but the walks along the headland to neighbouring Bronte or Coogee beaches are outstanding, particularly when the annual Sculptures by the Sea exhibition takes place. Jump on a ferry at Circular Quay and take the fifteen-minute journey to Taronga Zoo located on Sydney’s leafy north shore. Watch giraffes craning their necks in front of spectacular views of the city. Hear lions roar by the harbour. Or enjoy the Southern Ocean displays with penguins, seals, dolphins and more. It’s one of my favourite locations in Sydney and I’m always able to discover new exotic and native Australian animals. No visit to Sydney would be complete without a walk around the Royal Botanic Gardens situated on the shores of Sydney Harbour, next to the Opera House. The oldest botanic gardens in Australia, the collection includes plants from around the world with a focus on species from Australia and the South Pacific. Pack a picnic and take a free seat at Mrs Macquarie’s Chair, one of the loveliest natural viewpoints in Sydney. You can never spend enough time at the beach in Sydney and a drive along the Northern Beaches offers the chance to see plenty more. If you love beautiful sandy beaches, funky seaside townships, winding coastal paths and trails, and unspoiled ocean vistas, then this trip is for you. Head towards Palm Beach at the peninsula’s northern tip for a paddle on Pittwater, a walk up to the Palm Beach lighthouse or a lazy lunch at the Boathouse. Situated in the trendy suburb of Paddington, Oxford Street has long been one of Sydney’s favourite shopping stretches. Australia’s top fashion designers have set up home here, alongside an eclectic mix of bars, cafes and nightclubs. And all within five minutes of the city centre. So you’ve seen the harbour from its many vantage points – the Opera House, Harbour Bridge, and Circular Quay – but nothing beats a cruise on one of the many local tour boats. Enjoy a dinner cruise, jet boat adventure, romantic sailing tour or vintage tall ship experience to full appreciate one of the world’s finest deep water harbours. If you don’t like heights, stay on the ground and partake in a little Pitt Street Mall shopping. If you’re feeling adventurous, ride to the top of the Sydney Tower Eye for breathtaking 360 degree city views. For something more extreme, try the Skywalk experience where you can step outside the glass windows and walk around the Eye at the height of the Eiffel Tower – and twice the height of the Harbour Bridge!